In a place known as the central plains of Oklahoma, is the biggest amusement park in the state, Frontier City. 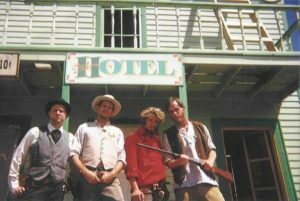 It is at this sacred ground, located on Adventure Road 35, that the longest running gunfight show in amusement park history takes place. This is the legendary “Not so Legendary Shootout at Crackaxle Canyon”. 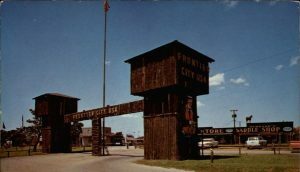 In 1957 during Oklahoma’s Semi Centennial Celebration Jimmy Burge, head of the Semi Centennial Committee, decided to open Frontier City just outside Oklahoma City on Route 66. Frontier City opened to the public in 1958 using the original buildings from the Semi Centennial which included a functional post office, saloon, bank, fire department, hotel, store fronts, marshal’s office, and jail. 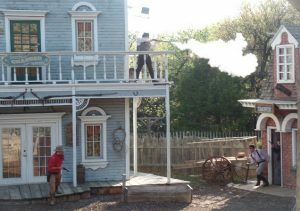 Added attractions were haunted farm, mine train, robbery reenactments, but the real gem of this park was the gunfights which soon became legendary. The first gunfight took place on May 30, 1958 (Opening Day) and took place in the middle of the street at the front of the four-block park. Guests entered the park for free and paid a quarter per person to watch the show. The show was so popular with the combination of action, comedy, and drama that hundreds, if not thousands, of guest would line both sides of the street to watch. The original show consisted of up to eight people and was divided between “The Law”, which included the Marshal of Frontier City Jim Rollins, and “The Outlaws”. 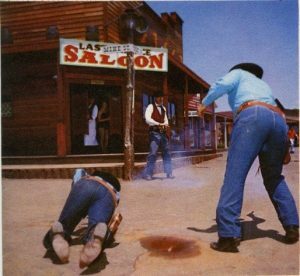 The gunfights were popular due to the unpredictability of the ending. The Outlaws won more often then they lost. Through the 60’s and 70’s, the park continued to grow adding spinning rides, rollercoasters, and a log flume called Mystic River. Even with all the changes the most popular attraction remained the Gunfighters. The gunfight shows took place every day the park had been opened over two decades. 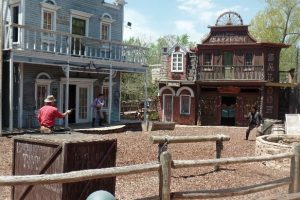 The gunfights and the gunfighters were so popular that several major movies and television shows were filmed at the park. The gunfighters reached their peak in the 1980’s. In the 80’s Jimmy Rollins, who was the original Marshall, helped to create Colonel Colt’s Company. 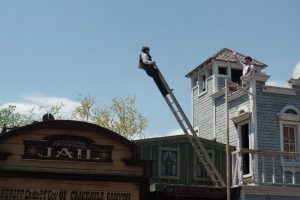 Members of the company would not only perform the gunfights multiple times a day at Frontier City, but they would also travel the country competing in national gunfight re-enactments and won several national championships. When Premier Parks took over Frontier City in the late 1980’s massive changes started at the park. Premier parks renovated fences, buildings, and attractions. They also brought in the very fun and unique wooden coaster Wildcat from the defunct Fairyland Park in Kansas City. The biggest change however was with the gun fight show. The gun fighters were moved from the main street into their own “Hollywood Style” theater. The Gun Fighter theater can fit several hundred people, and has a traditional western theme. Premier Parks took control and re-wrote the gun fight show which eventually led to a disagreement and a parting of the way with the Colonel Colts Company. In the late 2000’s Six Flags would be hit by the Great Recession, and had to file bankruptcy, which led to Frontier City being dropped by the Six Flags brand. The park would continue to operate as an independent park owned by EPR Properties before being brought back into the Six Flags family in 2018. 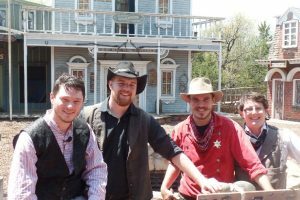 The Gunfighter show continues with the traditional four shows a day. Each year the show gets a slight tweak to keep it fresh. This season the Gunfighter show a Mexican standoff, a special guest appearance and several other surprises. For their 60th season one show per day will be a special behind the scenes show which will include audience involvement. Frontier City is in their 60th season. Guests will find five rollercoasters, a new 2018 zip line named Screaming Eagle, a children’s area, and many other unique attractions. Fall will bring some of the best haunted houses in the south-central plains. This holiday season will bring a brand new Frontier Christmas Extravaganza. So if you have a day and are looking for a absolutely great experience head out to Frontier City. Don’t forget to stop by and say hi to the gunfighters.